Most Memorable Threads' Here we gathered some of the most enjoyable or informative posts since March 2000. You cannot post here, only read and vote. 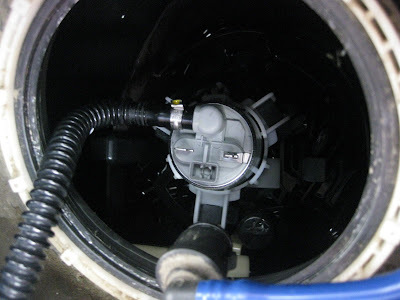 BMW M5 Forum and M6 Forums > General Forums > Most Memorable Threads' > Complete Fuel Pump DIY with pics! Complete Fuel Pump DIY with pics! 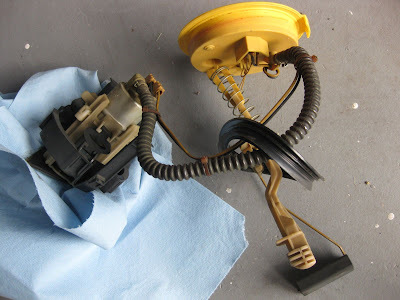 I just replaced my fuel pump over the weekend and wanted to give a little something back to the board by putting together one thread that should capture everything necessary for this DIY project. Searching the forum led to some other very helpful threads and useful info but it was somewhat scattered so I thought putting it all in one place would be better. Also, it seems like dying fuel pumps may be becoming more common as some of our Beasts rack up the miles. FWIW, my pump made it 122k...not too shabby. For those interested on background info, here is the recent thread I posted regarding my stuttering/stalling issues. Originally I thought oil separator hoses were contributing to the problem but in the end it was most certainly the fuel pump. This was reinforced this weekend as I was returning home from an errand and keeping an eye on the liters of fuel remaining in the tank, via the OBC, when the stuttering happened again and the Beast died just before the highway offramp near my house. OBC reported about 6 liters still left in the tank (I was trying to get it very low for the fuel pump swap) and down she went. Let it sit for a half hour, got it started and made it home to the garage. After swapping the fuel pump and turning it over 3 times (takes a little bit to regain fuel pressure in the system to start up), the Beast fired up fine and I drove straight to the gas station. Not really a DIY but more of a request to see if one was out there. Some info on the main fuel pump versus the siphon pump. Check out those links and make sure you take all the precautions listed in the Pelican Parts article, etc. Have gloves, lots of rags/towels and a fire extinguisher handy. Get your fuel level as low as you can, this is definitely less stressful when you are not dipping your entire hand into a full tank of gasoline. Definitely not a very hard DIY, with proper preparation and taking your time anybody can do this. On a scale of 1 to 10, with 1 being "you go to the dealership because your windshield washer fluid is low" and 10 being "you are Raza and you swap S62 motors in a weekend...while wearing flip-flops", this is about a 4. Fuel pump is part#16146752369. Mine came with a new rubber seal, #16141182905, as well as a hose clamp and zip ties. First, remove the rear seat cushion. It just pops up and pulls out. Lay some towels around and cover your passenger seatback and rear seat back with them. Better safe than sorry. 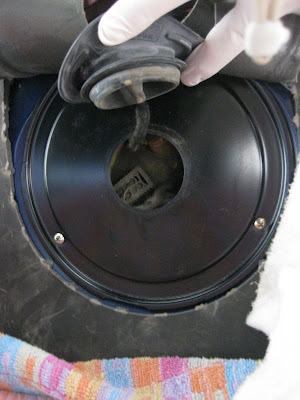 Pull out the large seal around the wiring and peel up the sound deadening material, use a razor knife if necessary. Unscrew the three (3) Philips screws and pull up the black cover. You can squeeze the large seal through the cover opening and fold it all over on the side so you aren't actually removing any of these things from the vehicle. 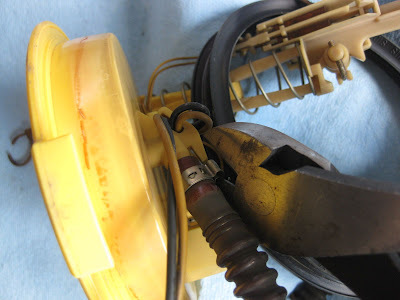 Next, remove the electrical connector by putting thumb and forefinger on the sides and sliding it towards you. This is the "fun with gasoline" part. Before you remove the fuel line connector, make sure your free hand has a ton of towels/shop rags/whatever in it. 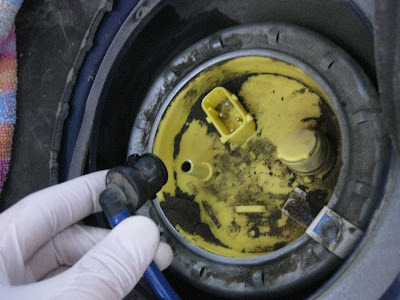 You're going to be releasing the built-up fuel pressure once you pull this connector and this is really the only part of the whole DIY where gas is going to spray out. 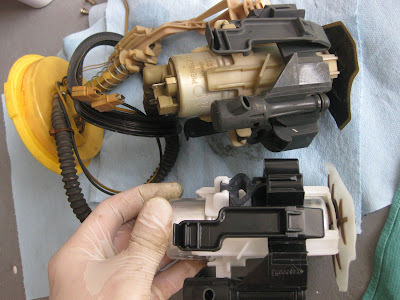 You will be pinching the two tabs on the connector sides and pulling up with one hand, while moving in at the same time to smother the connector with the rags to catch the gasoline spray. 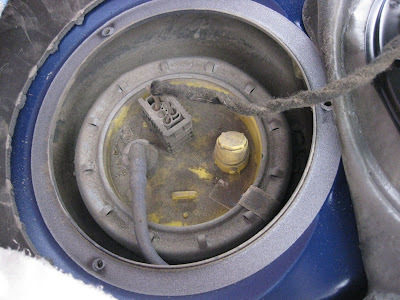 Make SURE you pull straight up with the connector and keep it right over the yellow lid at all times, so any fuel that drips will stay contained. My pic shows that I got a little spray over to the left side and if you get that gray seal ring wet, it will want to warp up a little so you are better off keeping the hose over the yellow part. No need to pull up fast on the connector but the pressure will start the spray as soon as you begin lifting it off. Once fuel flow has subsided, it's time to take off the metal ring. Use a flat-blade screwdriver and a rubber mallet to tap on those metal ridges. Spin the ring counter-clockwise and remove. Now the metal ring is off, it's a good time to clean up a little in there so that you won't be dropping any of this dirt and such into the gas tank. The yellow plastic part is the top of the float. It pulls straight up and out now, get it started by using a flat-blade screwdriver to gently pry in between the edge of the yellow plastic and the outer white ring. Once it starts coming up, carefully pull the float up and out. It is going to be attached to the fuel pump and it is easiest to keep it that way and pull the pump out with it. There are two black plastic tabs on either side of the pump, it is easy to push them in and the pump slides free. Pull them up and out together, make sure there are rags all around the opening to catch any fuel dripping off. I wrapped shop towels around them and removed them from the car. 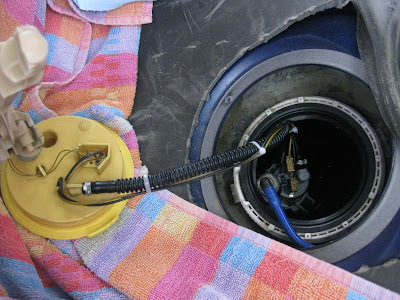 You can cover up the open gas tank by laying a towel over the opening just to ensure that nothing falls in while you are detaching the float from the old pump. Here is a shot of the old and new pumps, note the clean white filter mesh at the bottom of the new and the nasty black mesh on the old! 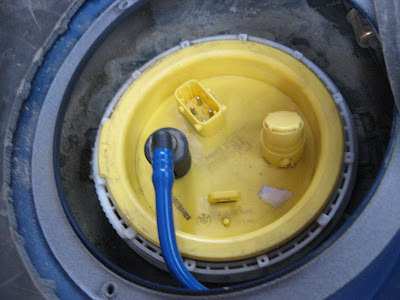 Also, you can see there are two electrical connections from the float to the pump, they have yellow housings on them. This picture shows them pulled off the spade terminals of the pump. Black wire is negative, Yellow is positive. There are "+" and "-" signs on the top of the pump. Time to clip off the wire ties holding the float wiring to the pump hose. Once that is done, the hose clamp holding the hose onto the float must be removed. This pic shows some cutters but that did not work out well for removing the clamp, it was much easier to put a small flat-blade screwdriver in the horseshoe part and pry open a bit until it loosened up. It's okay to damage the hose in getting it off the float, as your new pump should have one already attached, but be careful not to damage your float plastic! Before going further, make sure you put the new large rubber seal in the tank opening. It only goes one way and seems big at first but fits snugly once you get it in there. It is easier to put it on the tank hole now than to put it on the float itself. The float is now going to be reattached to the pump. First, slide the hose clamp onto the new hose and then attach the new hose onto the float, as shown in this picture. It takes some effort as it is a tight fit. Then lock in the hose clamp once it's in position (put it back where the original one was). I ended up using the cutters from the other picture to pinch this hose clamp in as the metal is very strong and it didn't cut it at all. 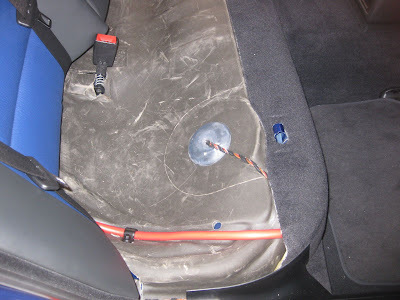 Here, the hose clamp is done and the wires are being routed along the hose and held in place with zip ties. The electrical connectors are now attached to the pump again. You're almost done. This is the last tricky part, getting the float put back into the tank properly. I don't have an action shot but basically you are lowering the long arm parts of the float into the tank where there seems to be room for them, which for me was closest to the passenger door. The float will go down there about 80% of the way and then it seems to get stopped up. Be gentle at this part and work slowly - you don't want to break the float when you are so close! The float sort of needs to be pushed down at the same time as you are rotating it clockwise, carefully of course! 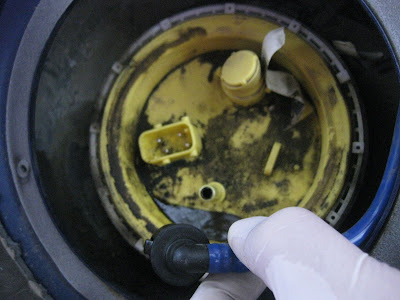 There is a tab on one side only of the yellow plastic float top, this tab sits on the section of the white tank ring closest to the rear seat of the car. 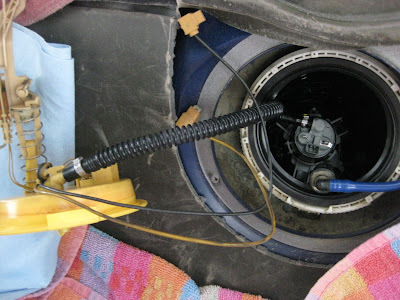 Once the float spins down and starts to get seated, just push down all around the yellow ring to firmly seat the float top into that rubber seal of the tank. This pic shows the float properly seated. Take the metal ring and reinstall it with the screwdriver and hammer in clockwise fashion until it is good and snug. Once it is in, all you need to do is plug the fuel supply line back in, followed by the electrical connector. 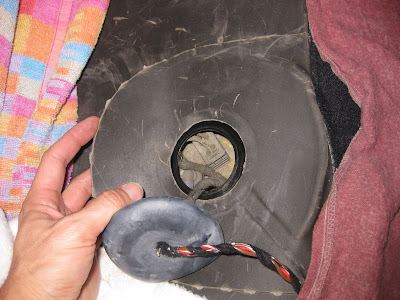 Reinstall the black plastic cover with the 3 screws, push the rubber seal with wires back through the sound deadening, lay that back down and push the seal back into place. I started the Beast and checked to make sure there were no issues back there before taking away the towels and reinstalling the rear seat bottom. Nothing left but to wash up and take the Beast for a spin!! Hope this DIY helps out, feel free to ask any other Q's about the process. Evolve SW, Alpha-N (MAF-delete) w/ IATS relocation, Dinan Stage 1 suspension, Rogue trans mounts, short shift, E46 ZHP shift knob, Magnaflows, Stoptech Slotted Rotors, Stainless front brake lines, ceramic pads, Beastpower titanium pedals, white LED interior lights. One of the best DIY threads ever! Should be a sticky, Gustav! I will be doing this over the holidays and was just going to wing it based on prior threads and figuring it out as I go, but this gives perfect guidance! Thanks very much. Wow great write up. Thanks! (in my best Bugs Bunny voice) Ehhhh, what's up doc?? EPIC thread here. Definitely one of the best DIY's written on the board thus far. ~Coming soon! 5.3 LS Twin Turbo Swap. Just another LS swap, but with 2 snails. Fantastic DIY, very detailed and easy to follow. Well done! Pull your fuel pump relay, start the car and let it die on its own, then try to start it again and maybe one more time for good measure. This should relieve any left over pressure in the fuel system. 2008 Ford Explorer Eddie Bauer 4x4. Takes the bad weather beating for the beast. What a great writeup, added to the frotn page updates!